Over time, the springs inside self-closing hinges break, and the cabinet doors will no longer close all the way. 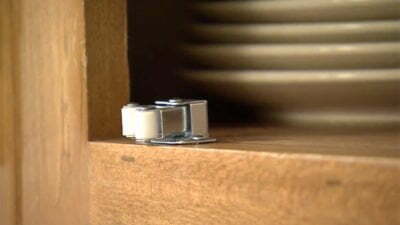 Instead of replacing the broken hinges, install roller catches to keep the doors closed. Watch the video for installation tips. You can use a pair of needle nose pliers to spread out the arms of the latch and loosen them, or just replace the roller catch with a magnetic one. Our the roller latches on our new China cabinet are too tight. Opening the doors takes great effort, we have to push hard to close them. Both directions result in loud bangs and a lot oglass rattling. Is there a way to loosen them so that they open and close more easily? Tell me how to align it with single cabinet door.